Duarte Pio speaking at the Royal Dinner of the Forty Conspirators; 2008. Dom Duarte Pio, Duke of Braganza (Duarte Pio João Miguel Gabriel Rafael; born 15 May 1945) is a claimant to the defunct Portuguese throne, as the head of the House of Braganza. The Miguelist Braganzas, to whom Duarte Pio belongs as great-grandson of King Miguel I, is a cadet branch of the House of Braganza. With the extinction of male-line dynasts descended from Queen Maria II in 1932, King Miguel's descendants became the only male-line Braganzas left and the closest male-line heirs to the Portuguese throne (the Brazilian branch having gone extinct in 1921). Duarte Pio is a figure within the European network of royal houses, often being invited to various foreign royal events. Despite his support for a monarchical government and widespread recognition as pretender to the throne, there are no major movements or parties that support restoration of the monarchy. In 1995, the Duke married Isabel Inês de Castro Curvelo de Herédia, a Portuguese businesswoman and descendant of Portuguese nobility. Their marriage was the first marriage of a Portuguese royal to happen in Portuguese territory since the marriage of King Carlos I, Duarte Pio's second cousin once removed, and Princess Amélie of Orléans, in 1886. The Duke and Duchess have three children, thus continuing the line of the Braganzas, as neither of the Duke's brothers have married nor had children. Duarte Nuno of Braganza was Duarte Pio's father and predecessor. Duarte Pio João Miguel Gabriel Rafael was born on 15 May 1945 in Bern, Switzerland, as the first of three sons of Duarte Nuno, Duke of Braganza, and Maria Francisca of Orléans-Braganza. His father was the grandson of King Miguel I, while his mother was a great-granddaughter of King Pedro IV (Emperor Pedro I of Brazil), who was King Miguel I's older brother. Through his father, he is a member of the Miguelist branch of the House of Braganza. Duarte Pio's godparents were Pope Pius XII, Queen Amélie (the mother of King Manuel II, the last monarch of Portugal) and his great-aunt Infanta Adelgundes, Duchess of Guimarães. The Duke is regarded as a Portuguese national by descent, since his father was Portuguese (and so Duarte Pio's birth was legitimately included in the Portuguese Civil Registry). At the time of his birth, Duarte Pio and the rest of the Miguelist Braganzas were banned from entering Portugal, by the laws of exile of 19 December 1834. 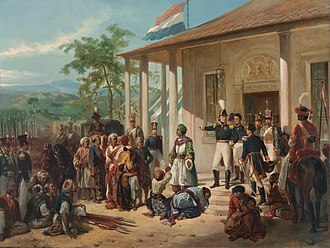 On 27 May 1950, the Portuguese National Assembly revoked both the laws of exile from 19 December 1834, which banned the Miguelist Braganzas, and the laws of exile from 15 October 1910, which banned the Legitimist Braganzas. In 1951, Dom Duarte visited Portugal for the first time, accompanied by his aunt, Infanta Filipa. In 1952, he moved to Portugal permanently with his parents and brothers. From 1957 to 1959, Duarte was enrolled in the Colégio Nun'Álvres in Santo Tirso. In 1960, he entered the Colégio Militar in Lisbon. He attended the Instituto Superior de Agronomia (now part of the Technical University of Lisbon) and later the Graduate Institute of Development Studies of the University of Geneva. From 1968 to 1971, Dom Duarte fulfilled his military service as a helicopter pilot in the Portuguese Air Force in Portuguese Angola at the time of the Portuguese Colonial War. In 1972, he participated with a multi-ethnic Angolan group in the organization of an independent list of candidates to the National Assembly. This resulted in his expulsion from Angola by order of the Prime Minister Marcelo Caetano. Duarte Pio claims the throne as the heir of King Manuel II according to the Constitutional Charter of 1826. A small number of Portuguese monarchists do not recognise Duarte Pio as pretender to the throne or as Duke of Braganza. The dispute dates back to 1828 when Duarte Pio's great-grandfather usurped the throne as King Miguel I. Miguel I was eventually exiled and his niece, Queen Maria II, was restored to her throne. According to the law of banishment (Lei do Banimento) of 1834 and the Constitution of 1838, Miguel I and all his descendants were forever excluded from the succession to the throne. However, the Constitutional Charter of 1826 was reinstated in 1842; this constitution (which was in place until 1910 when the monarchy was overthrown) did not bar Miguel's descendants from ascending the throne. In 1912 and 1922, Duarte Pio's grandfather, Miguel, Duke of Braganza, reconciled with King Manuel II, but this reconciliation was not accepted by all of their adherents. There are several monarchist organizations in Portugal which maintain that only the Cortes or the National Assembly could legally determine the rightful claimant if ever Portugal decided to restore the monarchy. One monarchist group in Portugal that did support Miguel, Duke of Braganza, instead of the deposed King Manuel II was the Integralismo Lusitano. 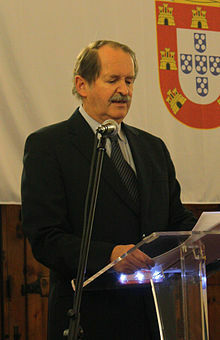 In May 2006, the Portuguese Ministry of Foreign Affairs issued a statement where it referred to Duarte Pio as Duke of Braganza. On 5 July 2006, in response to this statement, Nuno da Câmara Pereira, member of the Portuguese parliament and then leader of the People's Monarchist Party, addressed the President of the Assembly of the Republic, asking for a clarification as to the official recognition of Duarte Pio as pretender to the throne and as Duke of Braganza. In its official response on 11 July 2006, the Ministry of Parliamentary Affairs restated the fact that the Portuguese constitution guarantees the republican regime, and that the reference to Duarte Pio as Duke of Braganza was merely a polite courtesy. The Duke often interacts with both national and international political and cultural institutions, by which he represents the Portuguese people and their culture. Though not a head of state or official representative of the Portuguese state, Duarte Pio has been received with such honours by various foreign heads of state, government, and organizations. Duarte Pio often speaks on behalf of Portugal and the monarchist cause. Dom Duarte was a major campaigner for the independence of Timor-Leste, a former Portuguese colony which was forcibly annexed by Indonesia in 1975. 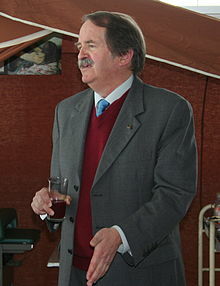 Before the issue's global popularity from the 1990s onward, the Duke contributed with several national and international campaigns for the political self-determination of the territory, including Timor 87 Vamos Ajudar and Lusitânia Expresso. 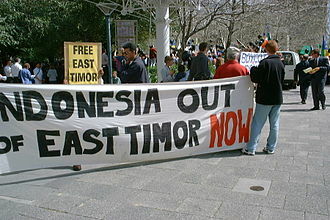 In 1997, Dom Duarte also suggested a referendum on the independence of East Timor to the Indonesian Vice-President Jusuf Habibie. 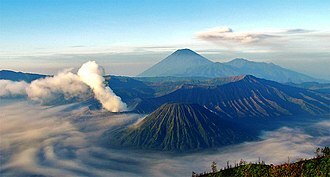 After Habibie became president of Indonesia in 1999, a referendum was held that resulted in the independence of the country. In December 2010, Timor-Leste President José Ramos-Horta expressed his interest in making Duarte Pio a Timorese citizen, which the Duke accepted, because of the "profound and spiritual relations of the Timorese people with Portugal", continuing by saying that the symbols of the House of Braganza have a "great significance" in Timor-Leste. In February 2012, with final approval and support of Timor-Leste parliament, President Ramos-Horta conferred Timorese citizenship upon Duarte Pio, along with the Order of Merit. President Ramos-Horta stated that these honours were given because of Duarte Pio's "dedication of a large part of his life to defending justice and liberty for the Timorese people". In September 2011, President Bashar al-Assad of Syria invited the Duke on a state visit to Damascus. The Duke stated he was invited by President al-Assad with the intention that Duarte Pio relay the Syrian head of state's plans and intents for Syria and its people. Duarte Pio told several Portuguese news outlets that it was the Syrian President's intention to "collaborate on the creation of a future constitution for Syria, close to that of Morocco, which guarantees political, religious, and press freedom." 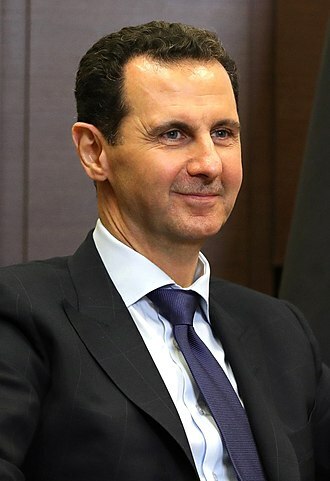 Alongside communicating the political and reformist intentions of the Syrian President, Duarte Pio stated that President al-Assad was a "good and well-intentioned man" and that "since he has assumed power, he has tried to democratize and humanize politics and [that] he has already achieved great advancements." In his capacity as the President of the King Manuel II Foundation, Duarte Pio is often involved with the Community of Portuguese Language Countries, intergovernmental organization for economic, political, and cultural friendship between Portugal and many of its former colonies. In 2009, the Duke petitioned for the King Manuel II Foundation to become a consultative observer within the CPLP, but with no success. In 2012, Duarte Pio petitioned, with Maria Hermínia Cabral, Director of the Calouste Gulbenkian Foundation, for their respective organizations to become CPLP consultative observers, to which both succeeded in their endeavor. In November 2012, for a meeting of the consultative observers of the CPLP the Duke visited Mindelo, Cabo Verde. While there, the Duke visited various locations within Cabo Verde, and was received by President Jorge Carlos de Almeida Fonseca. During the visit, Duarte Pio decorated President Almeida Fonseca with the Order of the Immaculate Conception of Vila Viçosa. Duarte Pio often visits various municipalities around the country, in an official charge, for economic and political events. On 14 November 2007, the Duke visited the Santiago do Cacém Municipality and was received with honours by the President of the Municipality, in the Palace of the Concelho. 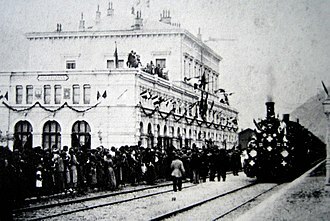 On 11 October 2011, Duarte Pio visited the freguesia of São Pedro de Oliveira, in Braga, and was received with honours by the President of the Freguesia Augusto de Carvalho. On 28 March 2012, the Duke and his son, Afonso, Prince of Beira, were guests of honour at the XII Exposition of Folar and Products of the Earth, an exposition staged for the purpose of economic promotion of products from the Valpaços Municipality. On 2014, the Court of Lisbon forbade Duarte Pio of Braganza from using the insignia of the Order of Saint Michael of the Wing and demanded that he compensate 300,000 euro to the legal owners of the rights, Nuno da Câmara Pereira, who allegedly registered the name "Order of Saint Michael of the Wing" (Portuguese: "Ordem de São Miguel da Ala") in 1981, whereas Duarte Pio is said to have registered it in 2004. The condemnation was repeated on October 5, 2015. but on November 3, 2015, the rights of Nuno da Câmara Pereira to the symbols was lost, and on December 7th, Duarte Pio of Braganza won the case and regained the legal rights. Duarte Pio speaking at the World Congress of Families XI, 2017. Duarte Pio often travels and visits various places, in an official charge, for matters concerning cultural affairs, both in Portugal and overseas. From 24 until 25 May 2009, the Duke visited Terceira Island, in the Azores Autonomous Region, as a guest of honour of the Santa Casa da Misericórdia, for the presentation of Mendo Castro Henriques's book, Dom Duarte e a Democracia – Uma Biografia Portuguesa. While in Terceira, Duarte Pio was received with honours by the President of the Municipality of Praia da Vitória and attended and visited various cultural and religious institutions and events, including a dinner at the Santa Casa da Misericórdia and assisting in a Portuguese bullfight. On 12 September 2011, the Duke, as President of the Henry the Navigator Award, a partner award of the Duke of Edinburgh's Award, visited Funchal, in the Madeira Autonomous Region, for an official visit. While there, the Duke was received with honours by Miguel Albuquerque, President of the Municipality of Funchal, visited the Municipal Gardens of Funchal and held a ceremony for the presentation of the Henry the Navigator Award. On 30 September 2011, Duarte Pio visited Vila Franca de Xira, as a guest of honour for the Royal Tourada, and visited various cultural institutions of the municipality, including the Museum of Neo-Realism and the Celeiro da Patriarcal. On 8 January 2012, the Duke visited the Vila Verde Municipality, as a special guest of the Association for Regional Development of Minho, where he attended an exhibition on regional culture and products and was presented a traditional Lenço de Namorados, made in 1912. Every year, on 1 December, Restoration Day, the Duke gives his annual speech in honour of the Portuguese Restoration at the dinner of the Forty Conspirators. 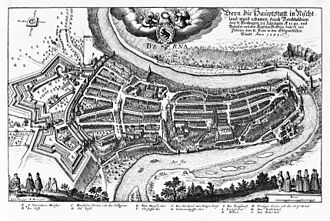 It was on 1 December 1640 that João II, Duke of Braganza, an ancestor of Duarte Pio, deposed the Portuguese House of Habsburg, installed the House of Braganza as the reigning house of Portugal, and restored sovereign rule to the Portugal. In his speeches, the Duke reflects on the historical significance of the date, events of the previous year, and the road ahead for both Portugal in general and the monarchist cause. In 2012, Restoration Day ceased to be an official holiday of the Portuguese state, prompting Duarte Pio to speak out against the action, stating that extinction of the official holiday "devalues the day which should unite the Portuguese". On 13 May 1995, Dom Duarte Pio married Isabel Inês de Castro Curvelo de Herédia, a Portuguese businesswoman and descendant of nobility. This was the first marriage of a member of the Portuguese royal family to take place in Portugal since the marriage of King Carlos I in 1886. The ceremony was celebrated in the Monastery of Jerónimos in Lisbon and presided over by Cardinal António Ribeiro, Patriarch of Lisbon. Representatives of most of the European royal houses were present. ^ a b "Disputa na sucessão dinástica portuguesa". Retrieved 21 December 2008. ^ Minet, Paul (May 1996). "Royal Births". Royalty Digest. V. No. 11: 316. ISSN 0967-5744. ^ Bragança, Duarte Pio de (September 2001). "Timor, que future?". Portvgal. Archived from the original on 23 May 2012. Retrieved 13 January 2013. ^ Lemos, Sérgio (1 December 2010). "D. Duarte já pediu nacionalidade timorense". Correio da Manhã. Retrieved 13 January 2013. ^ Lusa (10 February 2012). "Dom Duarte recebe nacionalidade timorense". Diário de Notícias. Archived from the original on 28 May 2015. Retrieved 13 January 2013. ^ Lusa (10 February 2012). "Duque de Bragança recebe nacionalide timorense". Sapo Timor-Leste Notícias. Retrieved 13 January 2013. ^ Lusa (13 February 2012). "Duque de Bragança cidadão timorense". Diário de Notícias. Archived from the original on 28 May 2015. Retrieved 13 January 2013. ^ "RTP TeleJornal – D. Duarte de Bragança Traz Recado de Al-Assad". Retrieved 4 August 2018. ^ "Expresso – D. Duarte Fez Viagem Diplomática à Síria". Retrieved 4 August 2018. ^ "Mário Crespo entrevista D. Duarte Pio - SAPO Vídeos". videos.sapo.pt. Retrieved 4 August 2018. ^ "Notícias MSN - Notícias do dia de Portugal e do mundo. Jornais, revistas, meteorologia, África, euromilhões, ciência e tecnologia -MSN". noticias.pt.msn.com. Retrieved 4 August 2018. 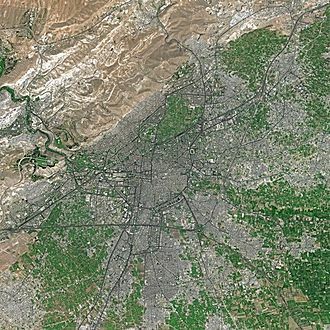 ^ "Parseria entre instituisaun sira importante tebtebes ba funsionamentu husi fórum sosiedade sivil nian - Notícias SAPO - SAPO Notícias". noticias.sapo.tl. Retrieved 4 August 2018. ^ "Duque de Bragança, Dom Duarte visita PR". www.rtc.cv. Retrieved 4 August 2018. ^ "D. Duarte Pio visita Santiago do Cacém". 16 April 2013. Archived from the original on 16 April 2013. Retrieved 4 August 2018. ^ "Gazeta de Visue – Visita de S.A.R., o Duque de Bragança Dom Duarte Pio a Oliveira São Pedro". Retrieved 4 August 2018. ^ "Visita de SS. AA. RR., o Senhor Dom Duarte, Duque de Bragança e do Infante Dom Afonso de Santa Maria, Príncipe da Beira, à XII Feira do Folar e dos Produtos da Terra". 30 March 2010. Retrieved 4 August 2018. ^ "D. Duarte de Bragança condenado pelo Tribunal do Comércio de Lisboa". Retrieved 4 August 2018. ^ "O.S.M.A. - Processo 93.07 - Acórdão do Supremo Tribunal de Justiça 05-10-2015". Retrieved 4 August 2018. ^ Lourenço, Marco Pereira, Rute. "Nuno da Câmara Pereira perde marca real". Retrieved 4 August 2018. ^ C.T. "Duarte Pio absolvido pelo tribunal". Retrieved 4 August 2018. ^ "Duque de Bragança vem ao Funchal". Retrieved 4 August 2018. ^ "Dom Duarte, Duque de Bragança visita Hortas Municipais do Funchal". 27 January 2012. Archived from the original on 27 January 2012. Retrieved 4 August 2018. ^ "O duque de Bragança, Dom Duarte Pio, visitou na tarde de sexta-feira, 30 de Setembro". Retrieved 4 August 2018. ^ "Extinção do 1.º de Dezembro desvaloriza dia que mais devia unir os portugueses, diz Duarte Pio". Retrieved 4 August 2018. ^ "Duarte Pio, herzog von Bragança, * 1945 - Geneall.net". geneall.net. Retrieved 4 August 2018. ^ "Illustrious Royal Order of Saint Januarius - Sacred Military Constantinian Order of St. George". 4 October 2012. Retrieved 4 August 2018. ^ a b "Membership". www.borbone-due-sicilie.org. Retrieved 4 August 2018. ^ "The activities of the Order since 1960". Archived from the original on 2015-09-23. Retrieved 2015-09-06. ^ "Zvanična Veb prezentacija Kraljevske Porodice Srbije". www.royalfamily.org. Retrieved 4 August 2018. ^ "Royal and Hashemite Order of the Pearl of Sulu". Royal Sultanate of Sulu. Retrieved 2018-01-11. ^ "Decreto Presidente 7/2012". Government of East Timor. Archived from the original on 15 November 2015. Retrieved 7 February 2016. ^ "ORDEM DE MALTA: Dom Duarte de Bragança consagra filho Dom Afonso a Nossa Senhora da Lapa". ORDEM DE MALTA. 27 September 2015. Retrieved 2018-08-24. ^ Menezes, Maria. "Família Real Portuguesa: DEZANOVE ANOS DE CASAMENTO DOS DUQUES DE BRAGANÇA". Retrieved 4 August 2018. Mendes, Nuno Canas. Duarte e Isabel, duques de Bragança: biografia autorizada. Mem Martins: Lyon Multimédia Edições, 1995. Morais, Jorge. D. Duarte: a primeira biografia. Lisbon: Chiado-Consultores de Informação, 1995. 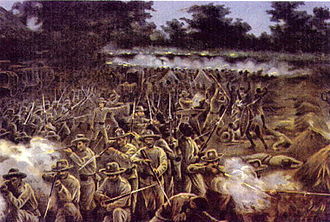 Fernandes, Clara Picão. Monarquia hoje? : diálogos com o Duque de Bragança. Lisbon: Editora Civilização, 1995. Wikimedia Commons has media related to Duarte Pio de Bragança. Fundação da Casa de Bragança Website of the Foundation of the House of Braganza. Bacharuddin Jusuf Habibie pronunciation is an Indonesian engineer who was President of Indonesia from 1998 to 1999. He succeeded Suharto, who resigned in 1998 and his presidency is seen as a transition to the post-Suharto era. Upon becoming president, he liberalized Indonesias press and political party laws, and held an early election in 1999. His presidency was the third, and the shortest, after independence, Habibie was born in Parepare, South Sulawesi Province to Alwi Abdul Jalil Habibie and R. A. Tuti Marini Puspowardojo. His father was an agriculturist from Gorontalo descent and his mother was a Javanese noblewoman from Yogyakarta and his parents met while studying in Bogor. Habibies father died when he was 14 years old, in 1960, Habibie received a engineers degree in Germany with the title Diplom-Ingenieur. He remained in Germany as an assistant under Hans Ebner at the Lehrstuhl und Institut für Leichtbau. In 1962, Habibie returned to Indonesia for three months on sick leave, during this time, he was reacquainted with Hasri Ainun, the daughter of R.
Mohamad Besari. Habibie had known Hasri Ainun in childhood, junior school and in senior high school at SMA Kristen Dago. The two married on 12 May 1962, returning to Germany shortly afterwards and his wife settled in Aachen for a short period before moving to Oberforstbach. In May 1963 they had a son, Ilham Akbar Habibie, when Habibies minimum wage salary forced him into part-time work, he found employment with the automotive marque Talbot, where he became an advisor. Habibie worked on two projects received funding from Deutsche Bundesbahn. Due to his work with Makosh, the head of train constructions offered his position to Habibie upon retirement three years later, but Habibie refused. In 1965, Habibie delivered his thesis in engineering and received the grade of very good for his dissertation. During the same year, he accepted Hans Ebners offer to continue his research on Thermoelastisitas and work toward his Habilitation and his thesis about light construction for supersonic or hypersonic states attracted offers of employment from companies such as Boeing and Airbus, which Habibie again declined. Dona Maria II the Educator or the Good Mother, was Queen regnant of the Kingdom of Portugal and the Algarves from 1826 to 1828, and again from 1834 to 1853. She was a member of the House of Braganza, born in Brazil, Maria was the only European monarch to have been born outside of Europe, though she was still born in Portuguese territory. The death of Marias grandfather, King João VI, in March 1826 sparked a crisis in Portugal. The king had an heir, but Pedro had proclaimed the independence of Brazil in 1822 with himself as Emperor. The late king had a son, but he was exiled to Austria after leading a number of revolutions against his father. Most people considered Pedro to be the heir, but Brazil did not want him to unite Portugal. Miguel pretended to accept, but upon his arrival in Portugal he immediately deposed Maria, during his reign of terror, Maria traveled to many European courts, including her maternal grandfathers in Vienna, as well as London and Paris. Maria was thereupon restored to the throne, and obtained an annulment of her betrothal, Maria II was heiress presumptive to her brother Pedro II as Princess Imperial, until her exclusion from the Brazilian line of succession by law no.91 of 30 October 1835. Maria married Auguste, Duke of Leuchtenberg, son of Eugène de Beauharnais, however, he died only two months later, on 28 March 1835. On 1 January 1836, she married the cultured and able Prince Ferdinand of Saxe-Coburg, in accordance with Portuguese law, Ferdinand received the title of king upon the birth of their first child and heir, Peter. In 1842, Pope Gregory XVI presented Maria with a Golden Rose, Marias reign saw a revolutionary insurrection on 16 May 1846, but this was crushed by royalist troops on 22 February 1847, and Portugal otherwise avoided the European Revolution of 1848. Marias reign was notable for a public health act aimed at curbing the spread of cholera throughout the country. She pursued policies aimed at raising the levels of education throughout the country, after constant pregnancies and births, doctors warned Maria of the dangers of giving birth nearly every year. However, she ignored the risks that had killed her mother, in 1853 she died in Lisbon giving birth to her eleventh child, Infante Eugénio, who himself died not long after. In 1942, the Duarte Nuno married Princess Maria Francisca of Orléans-Braganza, daughter of Pedro de Alcântara, Prince of Grão-Pará. The couple had three sons, the eldest of whom is Duarte Pio, Duke of Braganza, the current pretender to the Portuguese throne, Duarte Nuno had two older half-brothers, one older half-sister and eight sisters. 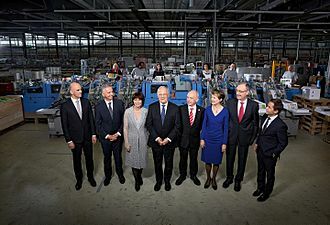 His paternal grandparents were Miguel I of Portugal and Princess Adelaide of Löwenstein-Wertheim-Rosenberg and his maternal grandparents were Charles, 6th Prince of Löwenstein-Wertheim-Rosenberg, and Princess Sophie of Liechtenstein. Duarte Nuno’s father was the Miguelist claimant to the throne of Portugal who opposed his cousins, Duarte Nuno’s family had been disinherited and banished by Maria II for rebellion. The day after his birth, Duarte Nuno was baptised at Seebenstein and his godparents were his aunt the Infanta Adelgundes, Duchess of Guimarães and the husband of another aunt, the Infante Alfonso Carlos, Duke of San Jaime. Duarte Nuno’s second brother, Prince Francis Joseph of Braganza, died in 1919, ten days on 31 July 1920 Duarte Nuno’s father, abdicated his claim to the Portuguese throne in favour of Duarte Nuno. 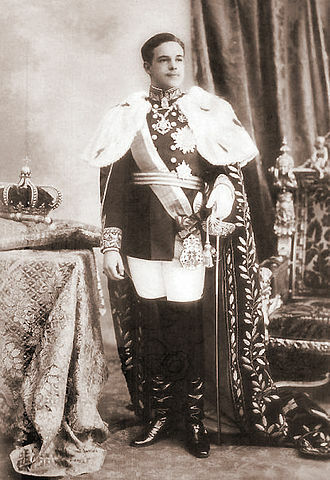 Henceforth the Miguelists recognised Duarte Nuno as King Duarte II of Portugal, even though Portugal had become a republic in 1910 when Maria II’s great-grandson, Duarte Nuno used Duke of Braganza as a title of pretense. In 1921, she issued a manifesto outlining the goals for the restoration of the monarchy. The Braganza-Saxe-Coburg line was called constitutional because it had accepted a liberal constitution for Portugal, after the death of his uncle Afonso in 1920, ex-King Manuel II had no close relatives who could claim the throne according to the Constitutional Charter of 1826. The conflict between the Miguelist line and the Braganza-Saxe-Coburg and Gothas was not just about which person should be sovereign, the Miguelists upheld Portugals tradition of autocratic absolutism, while the Braganza-Saxe-Coburg and Gothas adhered to Constitutional monarchy. 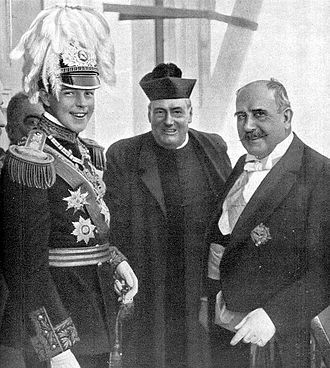 In 1912, Duarte Nuno’s father, met with Manuel to try to come to some agreement so that there would not be two claimants to the Portuguese throne, both living in exile. The University of Geneva is a public research university located in Geneva, Switzerland. It was founded in 1559 by John Calvin as a theological seminary and it remained focused on theology until the 17th century, when it became a center for Enlightenment scholarship. 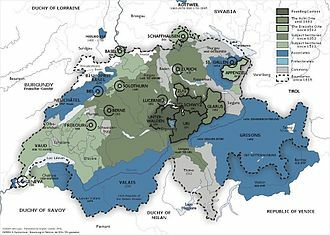 In 1873, it dropped its religious affiliations and became officially secular, the university is the second-largest university in Switzerland by number of students. In 2009, the University of Geneva celebrated the 450th anniversary of its founding, at least 40% of the students come from foreign countries. In 2015, it was ranked 58th worldwide by the Shanghai ranking, in 2011, it was ranked 73rd worldwide by the Academic Ranking of World Universities, and 69th in the QS World University Rankings. UNIGE is a member of the League of European Research Universities the Coimbra Group, the University of Geneva is located in several districts in the eastern part of the city and in the nearby city of Carouge, and the different buildings are sometimes very distant from each other. The oldest building is the Collège Calvin, and is not anymore a university building, built between 1868 and 1871, Uni Bastions is the symbol of Genevas academic life. It is located in the middle of a park and is host to the faculty of Protestant Theology and its architecture was inspired by Le Corbusier. It hosts the Rectorat and the administration of the University and it is Switzerlands biggest building dedicated to social sciences. It currently hosts the Faculty of Law, of Economics and Social Sciences, of Psychology and Education, the University of Geneva is structured in various faculties which are representing teaching and service to society in the various disciplines. Founded in 1876, ranked one of the top 100 medical schools in the world and it is one of the larger faculties of the University of Geneva in terms of budget and number of employees. Notable research areas include neuroscience and transplantation and it is closely associated with Switzerlands largest hospital complex, the University Hospitals of Geneva. Dom Pedro I, nicknamed the Liberator, was the founder and first ruler of the Empire of Brazil. As King Dom Pedro IV, he reigned briefly over Portugal, born in Lisbon, Pedro I was the fourth child of King Dom João VI of Portugal and Queen Carlota Joaquina, and thus a member of the House of Braganza. When their country was invaded by French troops in 1807, he and his family fled to Portugals largest and wealthiest colony, Brazil. The outbreak of the Liberal Revolution of 1820 in Lisbon compelled Pedro Is father to return to Portugal in April 1821 and he had to deal with threats from revolutionaries and insubordination by Portuguese troops, all of which he subdued. The Portuguese governments threat to revoke the autonomy that Brazil had enjoyed since 1808 was met with widespread discontent in Brazil. Pedro I chose the Brazilian side and declared Brazils independence from Portugal on 7 September 1822, on 12 October, he was acclaimed Brazilian emperor and by March 1824 had defeated all armies loyal to Portugal. A few months later, Pedro I crushed the short-lived Confederation of the Equator, in March 1826, Pedro I briefly became king of Portugal before abdicating in favor of his eldest daughter, Dona Maria II. The situation worsened in 1828 when the war in the south resulted in Brazils loss of Cisplatina, during the same year in Lisbon, Maria IIs throne was usurped by Prince Dom Miguel, Pedro Is younger brother. The Emperors concurrent and scandalous affair with a female courtier tarnished his reputation. Other difficulties arose in the Brazilian parliament, where a struggle over whether the government would be chosen by the monarch or by the legislature dominated political debates from 1826 to 1831. Unable to deal with problems in both Brazil and Portugal simultaneously, on 7 April 1831 Pedro I abdicated in favor of his son Dom Pedro II, Pedro I invaded Portugal at the head of an army in July 1832. Pedro I died of tuberculosis on 24 September 1834, just a few months after he, Pedro was born at 08,00 on 12 October 1798 in the Queluz Royal Palace near Lisbon, Portugal. The Assembly of the Republic is the Portuguese parliament. According to the Portuguese Constitution, the unicameral Assembly is the assembly of all Portuguese citizens. The constitution names the assembly as one of the organs of supreme authority. It is located in a building in Lisbon, referred to as Palácio de São Bento. The Palácio de São Bento has been the seat of the Portuguese parliaments since 1834, the Assembly of the Republics powers derives from its power to dismiss a government through a vote of no confidence, to change the countrys laws, and to amend the constitution. The assembly appoints members of important state institutions, such as ten of the thirteen members of the Constitutional Court. The constitution requires the assembly to review and approve an incoming governments program. Parliamentary rules allow the assembly to call for committees of inquiry to examine the governments actions, political opposition represented in the assembly has the power to review the cabinets actions, even though it is unlikely that the actions can be reversed. Party groups can call for interpellations that require debates about specific government policies, the assembly consisted at first of 250 members, but the constitutional reforms of 1989 reduced its number to between 180 and 230. Constituencies vary greatly in size, from as large as the district of Lisbon, which returns 47 representatives, to as small as the district of Portalegre, according to the constitution, members of the assembly represent the entire country, not the constituency from which they are elected. This directive has been reinforced in practice by the role of political parties in regard to members of the assembly. Party leadership, for example, determines in which candidates are to run for office. Moreover, members of the assembly are expected to vote with their party, party discipline is strong, and insubordinate members can be coerced through a variety of means. 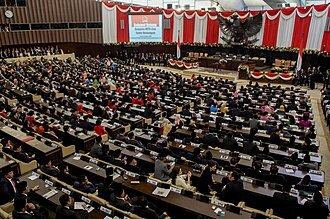 A further obstacle to members independence is that their bills first have to be submitted to the parliamentary groups, the President of the Assembly is aided by four vice-presidents, nominated by the other parties represented in the parliament, and is usually the speaker. The Portuguese Air Force is the aerial warfare force of Portugal. 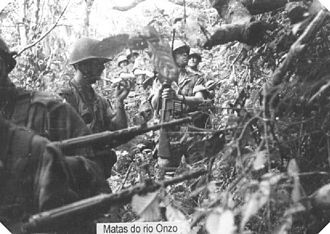 Locally, it is referred to by the acronym FAP, and it is the youngest of the three branches of the Portuguese Armed Forces. The Portuguese Air Force was formed on July 1,1952, the CEMFA is the only officer in the Air Force with the rank of general. Presently, the FAP is a professional force made of career personnel. As 2015, the FAP employed a total of 5957 military personnel, the Air Force further included 842 civilian employees. Besides its warfare role, the FAP has public service roles, namely assuring the Portuguese Air Search, until 2014, the FAP integrated the National Aeronautical Authority. The AAN is now a body, but continues to be headed by the Chief of Staff of the Air Force, with the Air Force assuring most of its activities. Its aerobatic display teams are the Asas de Portugal jet aircraft display team, the remote origins of the Portuguese Air Force lay in the origins of the Portuguese military aeronautics. Portugal was directly linked with the history of the aeronautics since its early beginnings, in 1709, the Portuguese priest Bartolomeu de Gusmão requested a patent for a device to move through the air, which consisted in a kind of hot air balloon. The patent was granted on the 19 April 1709 and small models of this device were tested with success in several occasions. Accordingly, with some opinions, a real device would have performed a crewed flight over Lisbon, taking off from the São Jorge Castle. This may have been the first manned flight in history, the AeCP becomes one of the major boosters of the development of the aviation in Portugal in the early 20th century, including of its military use. Despite the previous use of balloons by the Portuguese Army, its first air unit was created in 1911. This unit was the Aerostation Company, which was part of the Army Telegraphic Service and was intended to operate observation aerostats and this unit would receive a handful of airplanes. In 1912, the Portuguese Government receives its first airplane, a Deperdussin B, the Government further receives a Maurice Farman MF4 offered by the O Comércio do Porto newspaper and an Avro 500 offered by the Portuguese Republican Party. These aircraft would be integrated in the Aerostation Company, but remained years without use because of the inexistence of pilots, still in 1912, midshipman Miguel Freitas Homem of the naval purser branch applied for admission to any course that would qualify him as an aviator. Dom Carlos I of Portugal known as the Diplomat, Portuguese, o Diplomata and o Martirizado,28 September 1863 –1 February 1908) was the King of Portugal and the Algarves. He was the first Portuguese king to die a violent death since Sebastian of Portugal and this occurred in 1908, when Carlos was murdered in Lisbon as he travelled in an open carriage with the royal family. Carlos was born in Lisbon, the son of King Luís and Queen Maria Pia of Savoy, daughter of Victor Emmanuel II, King of Italy and he had a brother, Infante Afonso, Duke of Porto. 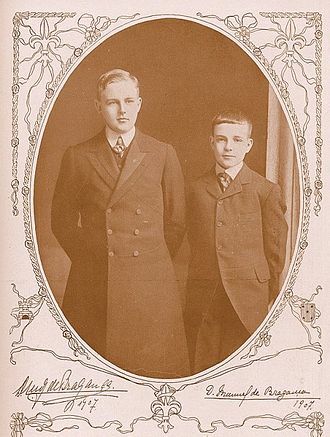 He was baptised with the names Carlos Fernando Luís Maria Víctor Miguel Rafael Gabriel Gonzaga Xavier Francisco de Assis José Simão and his paternal first cousins included Frederick Augustus III of Saxony, Princess Maria Josepha of Saxony, Prince Wilhelm of Hohenzollern-Sigmaringen and Ferdinand I of Romania. He had an education and was prepared to rule as a constitutional monarch. In 1883, he traveled to Italy, England and Germany, in 1883,1886 and 1888, he ruled as regent as his father was traveling in Europe, as had become traditional among the Portuguese constitutional kings. His father Luis I advised him to be modest and to study with focus and he met and married Princess Amélie of Orléans, eldest daughter of Philippe, comte de Paris, pretender to the throne of France. 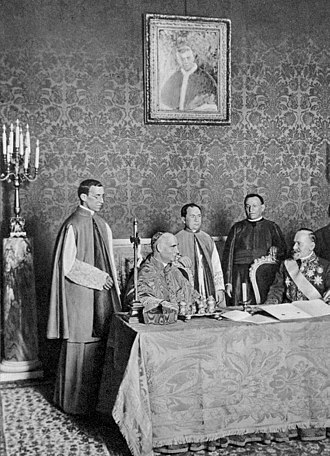 Carlos became king on 19 October 1889, after the 1890 British Ultimatum, a series of colonial treaties were signed with the United Kingdom of Great Britain and Ireland. One signed in August 1890 defined African colonial borders along the Zambezi and Congo rivers and these central African territories were taken over by Great Britain, however, a concession that was viewed as humiliating in Portugal. The agreements were thus looked upon as unpopular in Portugal and were felt to be disadvantageous to the country, Carlos responded by appointing João Franco as prime minister and subsequently accepting parliaments dissolution. As a patron of science and the arts, King Carlos took a part in the celebration of the 500th anniversary of the birth of Prince Henry the Navigator in 1894. The following year he decorated the Portuguese poet João de Deus in a ceremony in Lisbon, Carlos took a personal interest in deep-sea and maritime exploration and published an account of his own studies in this area. Military service is service by an individual or group in an army or other militia, whether as a chosen job or as a result of an involuntary draft. Some nations require an amount of military service from every citizen. A nation with a volunteer military does not normally require mandatory military service from its citizens. In this summary,195 countries are included, Compulsory military service has declined considerably since 1970. Albanias armed forces announced an objective to create an army by the end of 2010. Argentina suspended military conscription in 1995 and replaced it with a military service. It should be noted that military conscription has not been abolished, Conscription was known in Argentina as la colimba. Conscripts themselves were known and referred to as colimbas, voluntary service in the Boer War was initially from a number of the separate colonies before federation in 1901 and volunteers were deployed as an Australian force. Two conscription referendums were defeated during World War 1, Military service during WW1 was voluntary as was service in WW2. 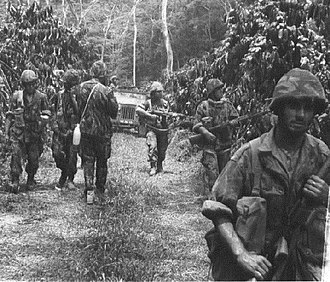 The Vietnam War was lost on 1 May 1975 over three years after the ADF withdrew in late 1971, all forms of conscription were abolished by the Whitlam Government in 1972. The country has set the age for voluntary recruitment into the Barbados Defence Force at 18. Younger recruits may be conscripted with parental consent, belgium suspended conscription on 31 December 1992 by amending the 1962 Law on Conscription, which became applicable only to conscripts drafted in 1993 and earlier. In practice this meant that the law no longer applied to those born in 1975, since 1 March 1995 the Belgian armed forces consist of professional volunteers only. Belize has set minimum age for recruitment into the Armed Forces at 18. Conscription has never been prescribed in the Defense Act, but is at the Governor General’s discretion and Herzegovina abolished compulsory military service as of 1 January 2007. The last conscripts were sent home on 25 November 2007, previously there was mandatory military service for male citizens from eighteen to twenty-seven years of age. He was a son of José Maria de Almeida Alves Caetano and his first wife Josefa Maria das Neves. A conservative politician and a reactionary in his youth, Caetano started his political career in the 1930s under the authoritarian regime of António de Oliveira Salazar. He soon became an important figure in the Estado Novo government, Caetano progressed in his academic career at the university, publishing several works and lecturing law. Between 1944 and 1947 Caetano was Minister of the Colonies and since 1947 President of the Executive Board of the National Union and he served as President of the Corporative Chamber between 1949 and 1955. From 1955 to 1958 Caetano was the two of the regime, as Minister Attached to the Presidency of the Council of Ministers, second only to Salazar himself. His relationship with Salazar was tense at times, hindering him from becoming clearly a successor, on the other hand, students who were supportive of the regime, tried to boycott the anti-regime activism. The core of these radical students lay in an uncompromising defence of the Portuguese Empire in the days of the authoritarian regime. In August 1968, at 79, Salazar suddenly suffered a stroke after a fall in his home, after 36 years as prime minister of the Estado Novo, he was removed from power by President Américo Tomás. After weighing a number of choices, Tomás appointed Caetano to replace Salazar on 27 September 1968, however, no one informed Salazar that he had been removed as leader of the regime he had largely created. By some accounts, when Salazar died in July 1970, he believed he was prime minister. Many people hoped that the new 102nd prime minister would soften the edges of Salazars authoritarian regime, Caetano moved on to foster economic growth and some social improvements, such as the awarding of a monthly pension to rural workers who had never had the chance to pay social security. Some large scale investments were made at national level, such as the building of an oil processing centre in Sines. The economy reacted very well at first, but into the 1970s some serious problems began to show, due in part to two-digit inflation, on the political side, Caetanos power was largely held in check by Tomás. A period cartoon, showing the conflict between the Two Brothers, as children, and the major States of Europe, as grown parents, trying to avoid the quarrel. Portuguese Farman F.40 in Mozambique, during the East African Campaign of World War I.
Piper L-21 Super Cub of the former Portuguese Army artillery observation light aviation (1952-1955). Radar site of the SDA air defense system's 13 Squadron, activated in 1957 at the Serra da Estrela peak. F-86F Sabre of the FAP's 51 Squadron, based in Monte Real from 1959. 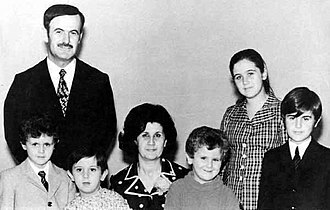 Hafez al-Assad with his family in the early 1970s. From left to right: Bashar, Maher, Anisa, Majd, Bushra, and Bassel. Bassel al-Assad, Bashar's older brother, died in 1994, paving the way for Bashar's future presidency. Portrait of a Young Fidalgo; a 16th-century rendition of a young Portuguese nobleman. The Queen wearing the Diadem of the Stars. Portuguese military parade in Luanda, Angola. Portrait of the Duke in the Pact of Paris, which he signed with King Manuel II. Duarte Nuno's wife, Princess Maria Francisca of Orléans-Braganza. Habibie(center) as Golkar Board of Patron member during the 1997 campaign in Tanah Abang, Jakarta. Portuguese overseas territories in Africa during the Estado Novo regime: Angola and Mozambique were by far the two largest of those territories.